The 416 Fire put up huge columns of smoke that formed a pyrocumulus cloud Saturday over Hermosa Mountain. A massive plume built Saturday afternoon over the 416 Fire north west of Hermosa. The 416 Fire at 1:32 p.m. Saturday, about the same time 220 additional homes were ordered to evacuate in the Hermosa area. The 416 Fire showed early signs of intense activity Saturday morning in the Hermosa Creek Drainage area. The 416 Fire was estimated to be 8,691 acres and 10 percent contained Saturday morning. No homes have been lost. 5:35 p.m.The San Juan National Forest and La Plata County government said they plan to enact Stage 3 fire restrictions early next week. Stage 3 restrictions could close federal lands, and in La Plata County, ban certain activities in unincorporated parts of the county. The county and area land agencies enacted Stage 1 restrictions in May and Stage 2 restrictions last week. La Plata County commissioners will consider enacting Stage 3 fire restrictions at its regular business meeting at 10 a.m. Tuesday at the Administration Building, 1101 East Second Ave. in Durango. 5:30 p.m.U.S. Highway 550 closed Saturday afternoon to help facilitate additional evacuations and will not reopen today. The highway is scheduled to reopen from 8 a.m. to 6 p.m. Sunday with law enforcement pilot vehicles escorting traffic through the closed area, with the southern closure point on the south side of Cometti/Mead Lane. The limited opening is subject to change at any moment, with the potential for rapidly changing fire behavior. County Road 203 is closed north of Trimble Lane. 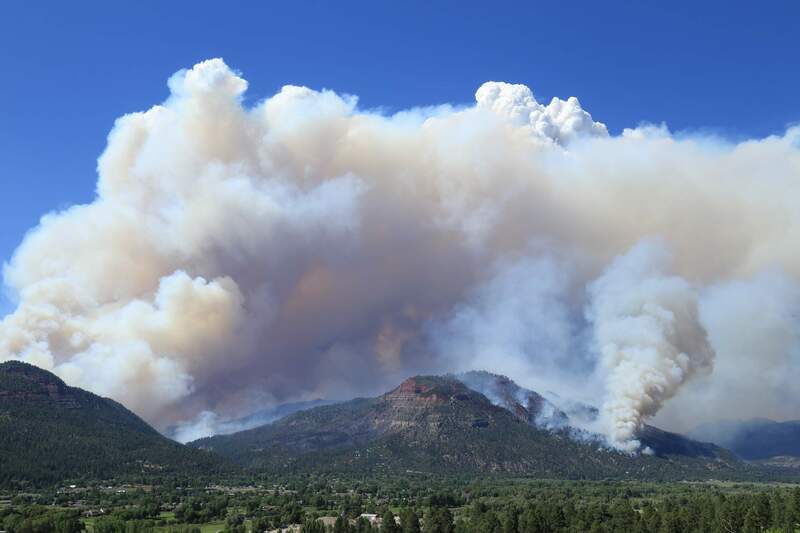 3:25 p.m.A huge plume of smoke billowed hundreds of feet into the blue sky Saturday near Hermosa, creating an ominous presence for thousands of residents who live in the Animas Valley north of Durango. Some residents scrambled to pack personal belongings, deciding it was time to leave. Residents on the eastern side of U.S. Highway 550 watched nervously as the smoke formed a mushroom-like cloud above Hermosa Mountain. Some golfers at Dalton Ranch became so distracted by the massive plume that they stopped playing the game to watch the fire. La Plata County issued evacuation orders at 1:30 p.m. Saturday to 220 homes in the Falls Creek and High Meadows subdivisions, as well as residents who live on the west side of County Road 203, from Trimble Lane to Cometti/Mead Lanes. 1:35 p.m.Additional evacuations were ordered about 1:30 p.m. Saturday for 220 homes in the Falls Creek Ranch and High Meadows subdivisions, and for residences on the west side of County Road 203 between Trimble Lane and Cometti/Mead Lanes. Law enforcement began notifying residents door-to-door at 1:30 p.m. Saturday, and a CodeRED notification was sent to residents. Residents are advised to evacuate the area as soon as possible. U.S. Highway 550 southbound will close indefinitely during the evacuation period while law enforcement officials notify evacuated residents door-to-door. Resident credentials for evacuees and those on pre-evacuation are available at the La Plata La Plata County Fairgrounds. They will be available throughout the afternoon and at a community meeting scheduled for 6 p.m. Saturday at the La Plata County Fairgrounds. Residences on the east side of County Road 203 east to the Animas River between Cometti/Mead/Albrecht Lanes south to Trimble Lane remain under pre-evacuation notice. 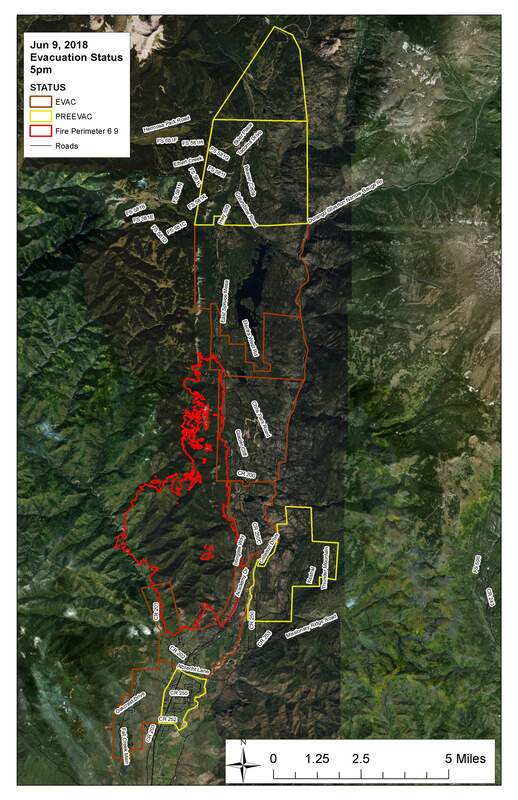 Prior to Saturday’s evacuations, 1,625 had been evacuated and 1,272 homes had been placed on pre-evacuation notice for the 416 Fire, which started June 1. The new evacuations means 1,845 homes are placed on evacuation and 1,052 homes are placed on pre-evacuation. The city of Durango is asking residents to avoid using Junction Street, provides access to the Falls Creek subdivision. 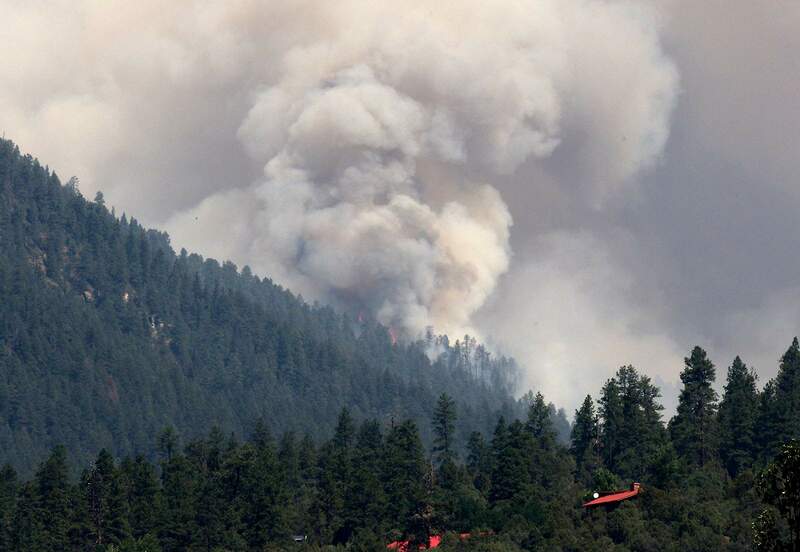 The road could be closed at a moment’s notice to accommodate firefighters who may need to access the Falls Creek subdivision, which is under evacuation for the 416 Fire, said Bob Brammer, with the Durango Police Department. 1 p.m.The National Weather Service issued a red flag warning until 9 p.m. Saturday. The warning was issued late Saturday morning as a result of wind, low humidity and high temperatures. 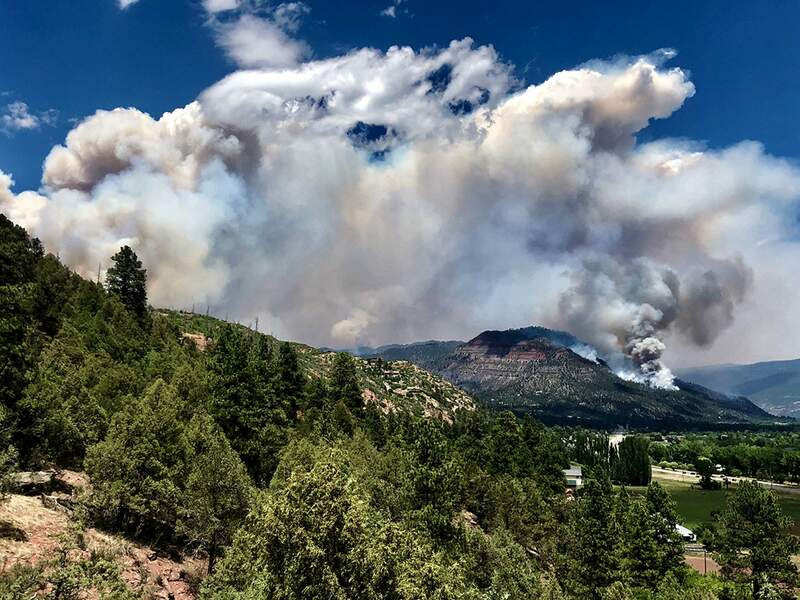 12:34 p.m.The San Juan National Forest announced it is closing a portion of the forest to public access as a result of the 416 Fire and the Burro Fire in Montezuma County. The public is prohibited from using Divide Road, Roaring Fork Road, Scotch Creek Road, Windy Gap Area Road, Spruce Mill Road, Upper Hay Camp Area Road and Hotel Draw Road. The closure includes Salt Creek Trail, Ryman Trail, Corral Draw Trail, the Colorado Trail from Molas Pass to Junction Creek, and Upper Ryman Trail. “With ongoing aerial firefighting operations and unknown future fire activity, the closure is necessary to protect public health and safety and provide for firefighters’ safety during fire operations,” the forest service announced in a news release. The Burro Fire is estimated to be about 100 acres with two hand crews and two engine crews on scene. No structures were immediately threatened. The closure will remain in effect until July 31, or until rescinded. Extension of the time period or closure area might change depending on fire activity. Violations of the closure are punishable by up to a $5,000 fine for an individual, or $10,000 fine for an organization, or imprisonment of up to six months, or a combination of the two. 12:15 p.m.San Juan Basin Public Health reported “unhealthy” levels of smoke Saturday morning throughout large parts of La Plata County, particularly along the Animas River from the 416 Fire location south to the New Mexico state line. The smoke gradually decreased as atmospheric mixing increased. By Saturday afternoon, smoke will begin to move in a northeasterly direction, which will bring periods of moderate to heavy smoke to rural parts of northeastern La Plata County, along with large sections of San Juan and Hinsdale counties. Late Saturday night, the winds will calm, and smoke will again drain southward along the Animas River and produce moderate to heavy smoke Sunday morning in areas such as Hermosa, Durango and points south to the New Mexico state line. Close windows and doors and stay inside. However, do not close up your home tightly if it makes it dangerously warm inside.Only if they are filtered, run the air conditioning, your evaporative cooler, or the fan feature on your home heating system (with the heat turned off). Keep the outdoor air intake closed and be sure the filter is clean. Filtered air typically has less smoke than the air outdoors. Running these appliances if they are not filtered can make indoor smoke worse.Use HEPA room air filtration units if you have them.Avoid smoking and/or secondhand smoke, vacuuming, candles, and other sources of additional air pollution.Do not use paper dust masks; these do not filter out the particles and gases in smoke. 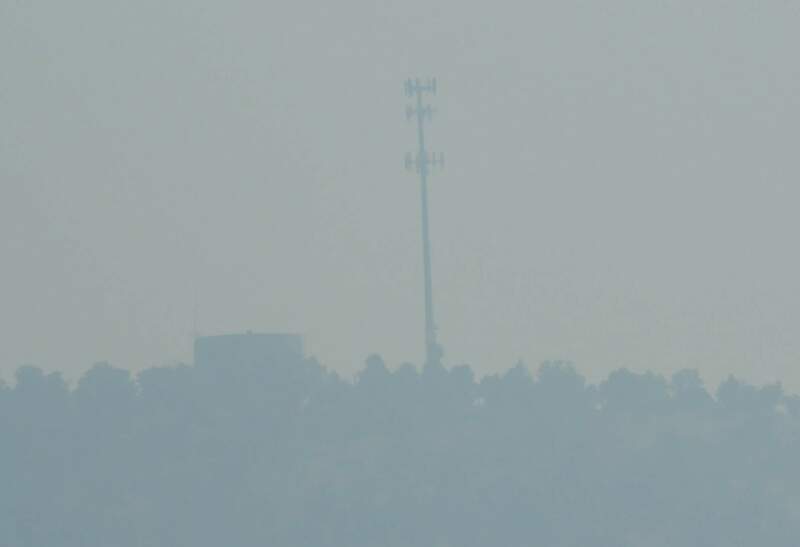 Thick smoke from the 416 Fire made for poor visibility Saturday morning across much of La Plata County. Earlier today:The 416 Fire showed signs of early activity Saturday, putting up a column of black smoke on the southeast flank of the fire, near the Hermosa Cliffs. The fire has grown by 1,511 acres, according to the most-recent mapping estimates released Saturday morning. It remained 10 percent contained. A community meeting is scheduled for 6 p.m. Saturday at the La Plata County Fairgrounds. Fire managers expect “severe” fire conditions Saturday as a result of dry conditions, high temperatures and strong wind gusts, said David Boyd, spokesman for Type I team. Firefighters planned to do battle on three fronts: the southwest portion of the fire near Hermosa Creek and County Road 201; the southeast portion of the fire near the Animas Village Apartments and the U.S. Highway 550 corridor; and on the north end of the fire, where hand crews will do structure protection in anticipation of fire growth, Boyd said. A federal Type 1 team took over command of firefighting efforts at 6 a.m. Saturday. The 9-day-old fire has 683 personnel, nine helicopters and three air tankers working the blaze Saturday. 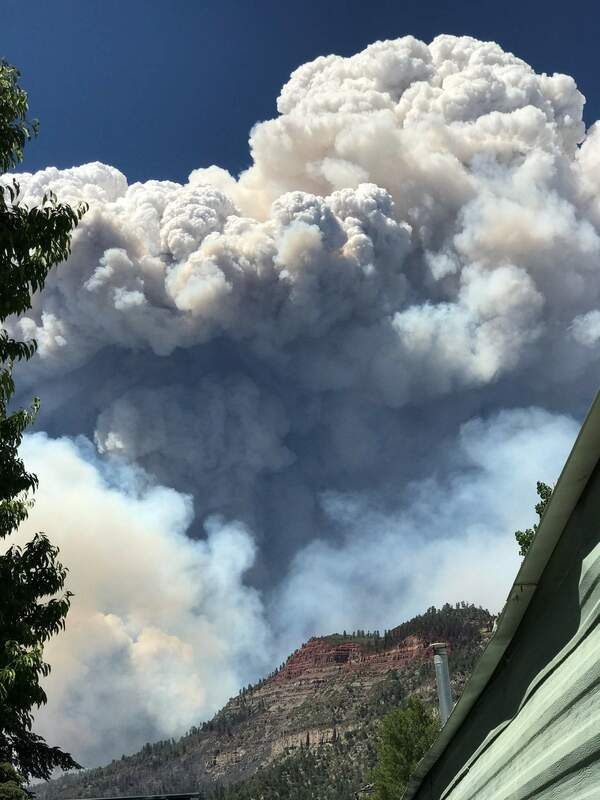 The fire has come close the Animas Village Apartments in the 34000 block of U.S. Highway 550, but fire managers said the progression has occurred in a controlled manner and firefighters are prepared to allow flames to approach without loss of structures. The technique is referred to as having “set up points,” in which firefighters allow the fire to come to them, then have a burnout area where they can engage the fire more safely. 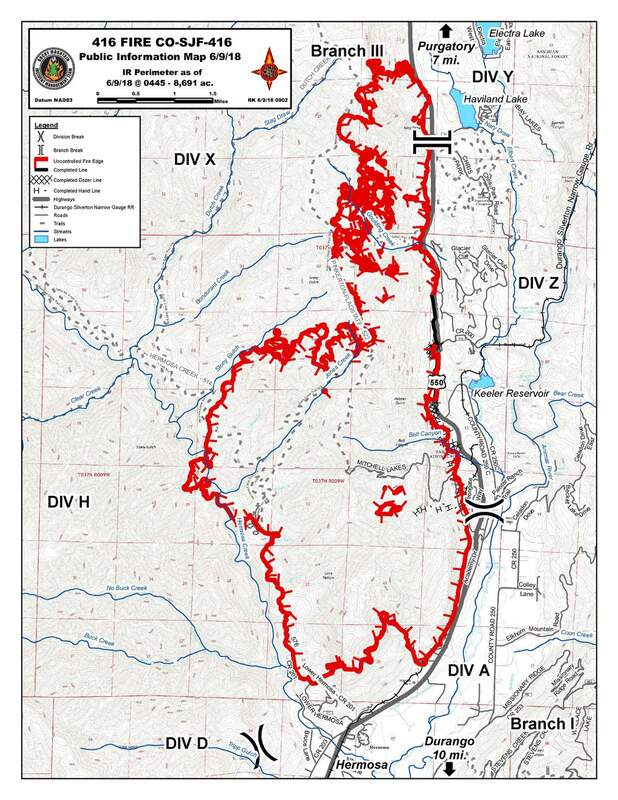 The fire was last mapped at 8,691 acres. Some of the new growth is the result of burnout efforts and some of it is the result of natural fire growth, Boyd said. Most of the new fire growth occurred on the west side of the fire. For Saturday, weather forecasters are calling for temperatures in the upper 80s with winds of 10 to 15 mph, and gusts up to 25 mph, said Matthew Aleska, meteorologist with the National Weather Service in Grand Junction. Forecasters issued a red flag warning until 9 p.m. Saturday. Sunday is expected to be windier as a system moves into the area. Another red flag warning is in effect from 10 a.m. to 10 p.m. Sunday, meaning hot temperatures, high winds and low humidity. The next best chance of precipitation will be late next week. “There will be no precipitation at least through the middle of next week,” Aleska said. A smoke advisory is issued for the area.